The thump of steel drums pierced the usual serious mood at Aberdeenshire Council’s headquarters last night as the authority celebrated the region’s cultural output - and laid plans to improve it. The ruling administration has said it has much to be proud of after its first year in power. Controversial plans to keep the authority’s headquarters in Aberdeen were never going to be “unanimously” popular, the council leader has said. Plans to move the headquarters of Aberdeenshire Council to Inverurie were scrapped yesterday and described as a “hammer blow” for the north-east town. A political row has been sparked over a proposed U-turn on the sale of a north-east council’s headquarters. Ambitious plans by Aberdeenshire Council to relocate its HQ to a new office at a north-east football club remain on course, despite a change in administration. A £40million deal to create a new council HQ at a north-east football ground moved forward yesterday when politicians backed the idea. Political leaders have united behind plans to build a new local authority headquarters after a bitter row. Multimillion-pound plans to build a new council headquarters on a north-east football ground could take a step forward next week. Multimillion-pound plans to relocate Aberdeenshire Council's HQ to a north-east football ground could be funded by a loan. Is the uncertainty over future of council HQ costing taxpayers thousands? Aberdeenshire Council chiefs have denied suggestions that uncertainty over the future of a north-east headquarters is costing taxpayers tens of thousands of pounds. Aberdeenshire's newest councillor has said his constituents are more concerned about a tax hike and new leisure facilities than a £37million HQ. Details of "visionary" plans to transform a north-east football ground into a £37million headquarters have been unveiled by Aberdeenshire Council. Is Aberdeenshire Council’s Woodhill House HQ up for sale? An SNP campaign leaflet claiming Aberdeenshire Council's headquarters is up for sale has been branded "misleading" after being sent out to voters. A councillor wants a shut down secondary school site to be considered as a potential location for the local authority's new HQ. Opposition councillors have demanded assurances that major capital projects - such as the new Peterhead Academy - will not be jeopardised by plans to build a new headquarters. Aberdeenshire Council is poised to take over the grounds of a Highland League football club for its new headquarters, it can be revealed. A row has erupted over the future of Aberdeenshire Council's HQ after an opposition leader branded plans to built a replacement as a "vanity project". Aberdeenshire Council is set to abandon its civic headquarters at Woodhill House in Aberdeen in favour of a "pivotal" move to Inverurie. A "huge question mark" is hanging over a proposal to sell off Aberdeenshire Council's HQ to balance the budget, opposition councillors have claimed. Councillors are expected to vote to overhaul how council businesses is conducted in the north-east when they meet in Aberdeen today. Aberdeenshire Council's ruling administration is planning a radical overhaul of the way major decisions are made. Aberdeenshire Council's co-leaders have claimed they are delivering on their priorities, 12 months after taking charge. Aberdeenshire councillors are poised to swing the axe and cut £28million from the local authority's budget this year. 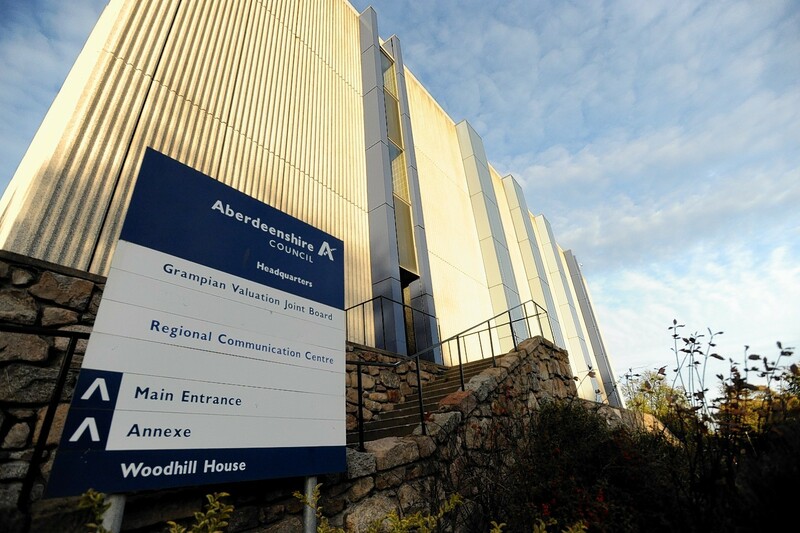 Aberdeenshire Council's Woodhill House headquarters could be sold to NHS Grampian, the Press and Journal can reveal. Aberdeenshire Council's ruling administration has been accused of misleading the public over the true financial benefits of selling off its main headquarters at Woodhill House. Aberdeenshire Council could sell off its Woodhill House HQ to help fill a multimillion-pound budget black hole. Public opinion will shape Aberdeenshire Council's plan to make nearly £20million of spending cuts next year, a senior councillor has said. Flags at Aberdeenshire Council HQ have been lowered to half mast following the death of one of its longest serving councillors.